The school of Panarea is open to students, graduates, specialists, PhD and post-doctoral students in scientific disciplines and professionals engaged in study and management of the land/sea. Topics will cover the geological characteristics of this unique active volcanic area, its biological components adapted to natural ocean acidification in the local vents systems, and hydrothermal fluids characterization. Participants will be trained in multi-parameter monitoring techniques and definition of experimental protocols for the sampling and study of the planktonic and benthic ecosystems, with special focus on assessing effects of climate change and ocean acidification on organisms, communities and habitat. The course consists of 15 hours of multidisciplinary frontal lessons and 8 scientific dives. Lectures concern topics of Physical, Chemical and Biological Oceanography, Marine Ecology and Earth Sciences, with specific focus on Marine Hydrothermal System. 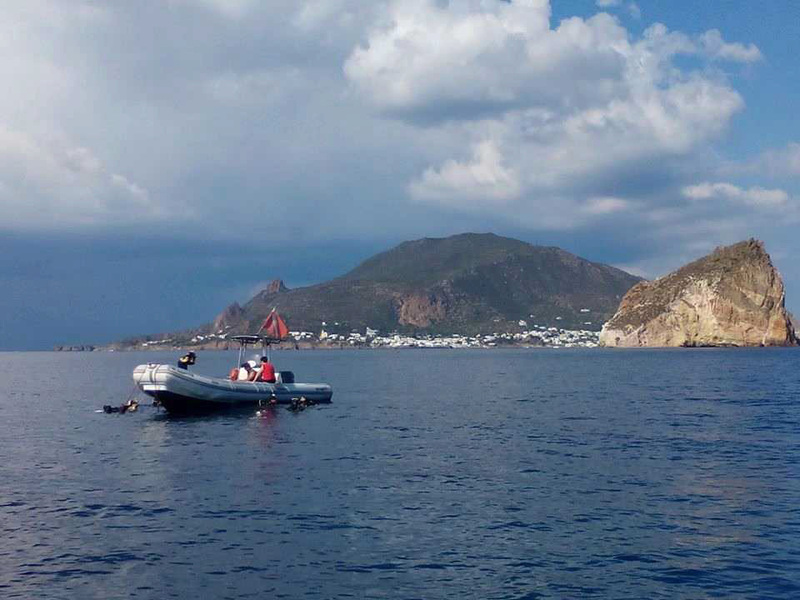 A half-day field trip to Volcano Island (1 hour from Panarea) is planned during the Summer School. Cinzia De Vittor (OGS, Trieste), Sabina Bigi (Università La Sapienza, Roma), Maria Cristina Gambi (Stazione Zoologica Anton Dohrn, Napoli), Manfredi Longo (INGV, Palermo), Stanley Beaubien (Università La Sapienza, Roma), Marco Munari (Stazione Zoologica Anton Dohrn, Napoli), Rocco Auriemma (OGS, Trieste), Valentina Esposito (OGS, Trieste). Any kind of diving license with at least 20 certified dives is required; a medical certificate for diving activity not older than 1 year; DAN (or equivalent) insurance for underwater activities. Participants must be provided with complete diving equipment, jacket, 2 regulators or octopus, underwater diving computer, underwater whiteboard, underwater net and compass. Tanks and weight belt are included in the participation fee. If needed, it is possible to rent the missing equipment at the Amphibia diving. For front lessons, laboratory exercises and underwater activities (8 dives) the cost is 500,00 € per person (to pay directly to the Diving Center Amphibia). Accommodation costs in a conventioned Hotel will be € 50.00 (single room/day), € 60.00 (double room/day), € 80.00 (triple room/day). Dinner in a conventioned restaurant will be 18.00 €; 10% reduction on lunch in a conventioned restaurant will be available. Payments will be made by participants directly to the conventioned structure. The cost of the field trip to Volcano Island (ferry and lunch) is not included. The school will be held in Panarea (Aeolian Archipelago, Italy) at the ECCSEL NatLab-Italy, located in road San Pietro. Panarea Island can be most easily reached by ferry from Naples, where there is an International airport. Additional information on how to reach Panarea and where to stay will be provided to candidates by e-mail. Complete and send the application form with all your personal and educational information, plus a Curriculum Vitae with specific reference to your diving experience, no later than 2nd July 2018 at scuolasubpanarea@gmail.com. Minimum number of participants for the School to be held is set to 8; maximum number of participants is 12. Admission to the Summer School is subjected to the requirements mentioned above, and to the assessment of the organizers and teachers. Admitted students will be contacted directly to the email address they have indicated. the licence of European Scientific Diver or Advance European Scientific Diver.